← Flotsam and jetsam or contemporary collections? The north-east corner of the old Cloncurry Cemetery is the resting place for many cameleers who lived and worked in Queensland during the late 19th and early 20th Century. 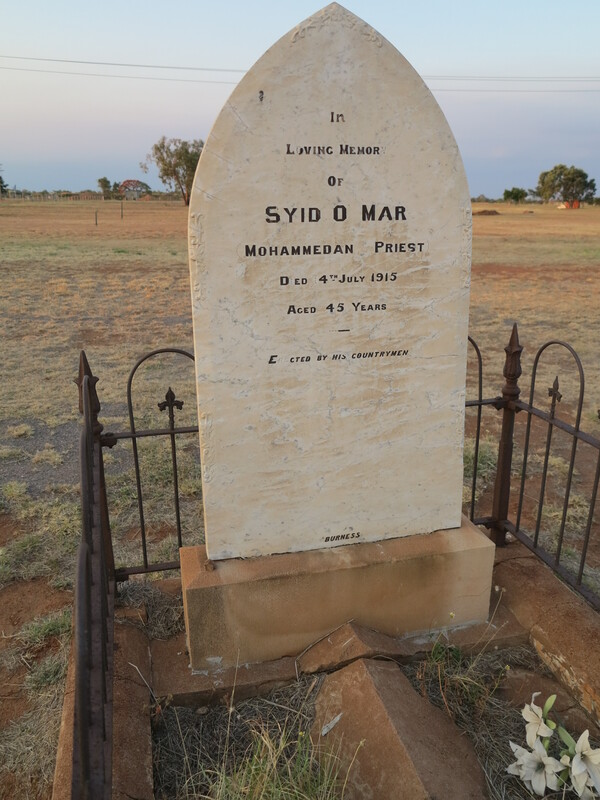 Although there are many graves, only the headstones of Cloncurry Ghantown’s mulla (priest) Syid O Mar (1915), and aboriginal woman, Nellie Edwards (1936) remain. Nellie Edwards may have been a cameleers wife or a rare convert to Islam. Afghan graves are aligned north-south with the head in the north and the face of the interred turned towards Mecca, the Muslim holy city. The Afghans and their camels were brought to Australia to provide transport for explorers and settlers in the arid inland where conditions were too harsh for horses and bullocks. Their camps were established on the outskirts of railhead towns and shipping ports and were known as Ghantowns. The cameleers, with their strings of camels, carried supplies, tools and machinery from the nearest railhead to homesteads, mining camps and townships. They returned with bales of wool and bags of ore. During the late 1890s and early 1900s there were more than 200 Afghans and about 2000 camels in the Cloncurry district making it the largest Ghantown in Queensland. Museum Development Officers Ewen McPhee and Dr Jo Wills were in Cloncurry recently working with Gail Wipaki (Mary Kathleen Park) on a new exhibition space which will feature the Afghan cameleers. Posted on 7 November 2012, in Uncategorized and tagged afghan, cloncurry, ewen. Bookmark the permalink. Leave a comment.